An online archive of chronology of events, documentations, audio, video, images, media reports and eyewitness accounts of the 1971 Genocide in Bangladesh in the hands of Pakistan army. Janauary 8: President Zulfikar Ali Bhutto accompanied Bangabandhu Sheikh Mujibur Rahman to Chaklala airport. Sheikh Mujib Returns to Dhaka via London, with a stop-over in New Delhi. Mujib’s first diplomatic achievement: Indian troops leave Bangladeshi soil, dispelling any fear of a new occupation by a new colonizer. Banglapedia’s entry on The Constitution of Bangladesh including the major amendments. Evolution of Fundamental Principles of 1972 – Bangladesh Constitution. The Four Founding Principles: Democracy, Socialism, Secularism, and Bangalee Nationalism are adopted by the new government to be the foundations of a constitution for the newborn nation. January 30: While looking for his missing brother Shahidullah Kaisar, film-maker Zahir Raihan disappears — his car is found outside an enclave serving to protect the Biharis; the anti-liberation forces are still believed to be active in their subversive roles against pro-liberation intelligentsia. Pakistan refuses to accept this ethnic group, who had originally emigrated from the state of Bihar, India during the Partition, and were mostly aligned with the West Pakistanis before and during the War; the Bangalees cannot accept them for their complicity in the genocidal atrocities of the Pakistani army (as Al Shams); the Red Cross sets up a number of enclaves, including the Geneva Camp in Dhaka, in order to protect them from further violence by Bangalee mobs. 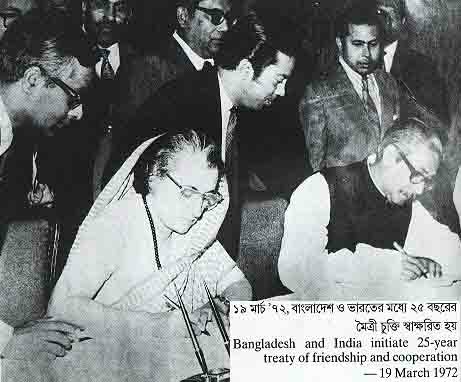 February 19: Sheikh Mujib and Indira Gandhi signs the 25-year treaty of friendship and cooperation between Bangladesh and India in Dhaka. March 1: Sheikh Mujib went to the Soviet Union on an official visit. 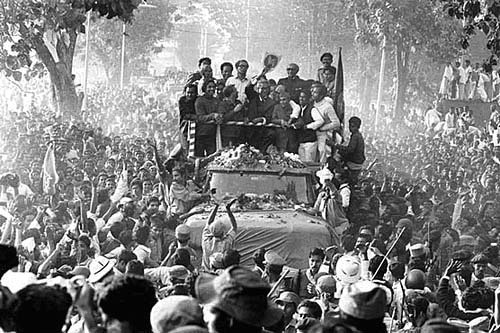 March 17: The allied Indian army left Dhaka at the request of Bangabandhu Sheikh Mujibur Rahman. The Indian Government and the provisional Government of Bangladesh agreed to cooperate fully with the Commission, but unfortunately the former Pakistan Government refused their cooperation, contending that the subject of the enquiry was a purely internal matter. The Indian army will withdraw from West Pakistani territory occupied since 1971 war. The complete text of Simla agreement. 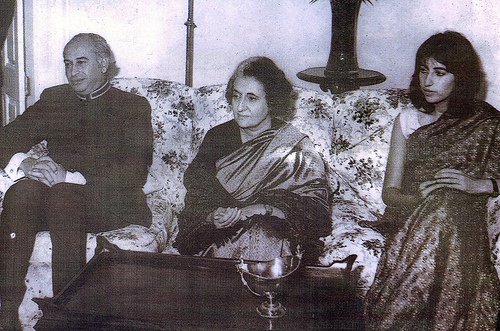 The Simla Talks at the behest of the Indira Gandhi Government over the fate of the Pakistani Prisoners of War end up in unconditional pardoning of all; in return the Pakistani governmernt agrees to return all the Bangladeshi Civil Servants and Army Officers held in various concentration camps since 1971; however, it also refuses to admit the Biharis stranded in Bangladesh opting for Pakistani citizenship. Sheikh Mujib also pardons most of the native (Bangalee) Collaborators, except for those accused of criminal activties. Nov: 617 Indian POWs held since 1971 War are unilaterally released by Bhutto. December 16: On the first anniversary of liberation the Constitution of the Peoples Republic of Bangladesh was adopted. The re-organization of the administrative system, adoption of the constitution, rehabiliation of ten million people people, restoration and development of communication system, expansion of education, supply of fre books to students upto class five and at low price to students up to class eight, effective ban on all anti-Islamic and anti-social activities like gambling, horse races, liquor, establishment of Islamic foundation, re-organization of Madrassa Board, establlishedment of 11,000 primary schools, nationalization of 40,000 primary schools, establishment of women’s rehabilitation centre for the welfare of distressed woman. Freedom Fighters Welfare Trust, waiving tax upto 25 bighas of land, distribution of agricultural inputs among farmers free of cost or at nominal price, nationalization of banks and insurance companies abandoned by the Pakistais and 580 industrial units, employment to thousands of workers and employees, construction of Ghorashal Fertilizer Factory, primary work of Ashugangj Complex and establishment of othe new industrial units and reopening of the closed industries. Another landmark achievement of the Bangabandhu government was to gain recognition of almost all countries of the world and the United Nations membership in a short period of time.